Workers carry salt out of a field south of Ban Laem, in Petchaburi province, during the 2017 salt harvest. I photographed the salt harvest this week. 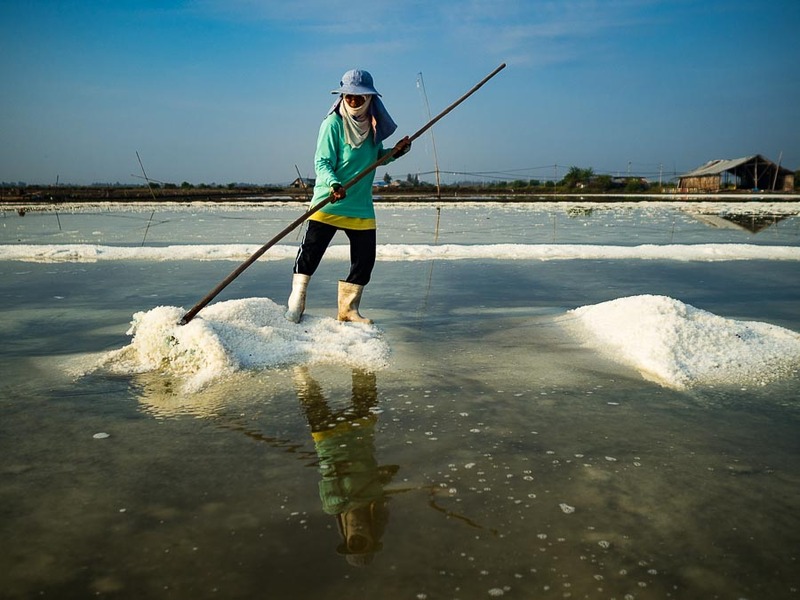 It's the fourth or fifth time I've photographed workers in Thailand's salt fields. 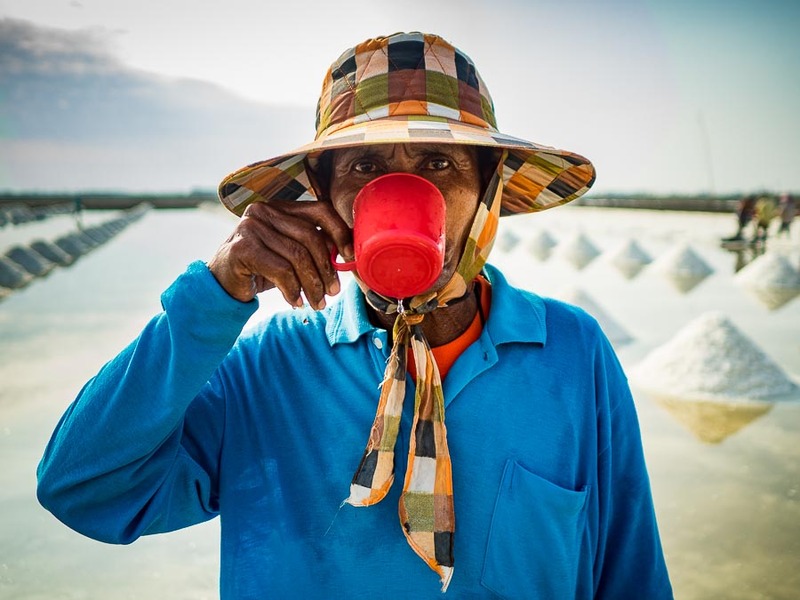 I like photographing people who "make stuff," including the men and women who work in the salt fields. A worker gets a drink of water. The first couple of years I photographed the salt fields, I went to fields in Samut Sakhon province, less than an hour from Bangkok. The first year I went, 2009, there plenty of fields to choose from and the workers did almost everything by hand. The area is close to Bangkok though and many of the fields were sold and turned into industrial parks and factories. There are still some salt fields around Samut Sakhon, but it's getting harder to find them and the fields are frequently bordered by factories or housing estates and it's difficult to photograph the fields without getting an ugly hulking factory in the background (which is great if you're doing a story about industrial encroachment on traditional industries but not so great otherwise). Last year I couldn't find any fields in Samut Sakhon that I really liked and I went further down the coast to Petchaburi province. It's about 90 minutes past the fields in Samut Sakhon, so the travel time is more than doubled. Photographically it's worth it though because the fields are more photogenic. A worker picks up her salt baskets. She'll carry them to a warehouse about 50 yards away. Almost every small salt farm has its own warehouse. The warehouse in the background is on a neighboring farm. The other thing I like about working the fields in Petchaburi is that the work is still done in the traditional way - using bamboo baskets to carry the salt from the fields to the warehouses. Most of the salt gathering operations in Samut Sakhon have started using wheelbarrows. Gathering salt this way is back breaking work. 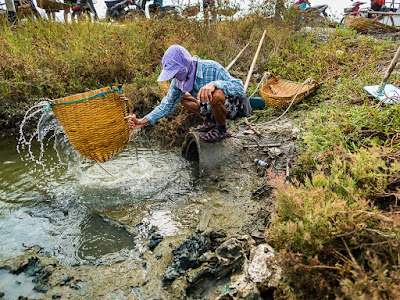 It's hot (late February through April is the hottest time of year in this part of Thailand) and humid (workers spend their entire days working in 2-3 inches of brackish water). 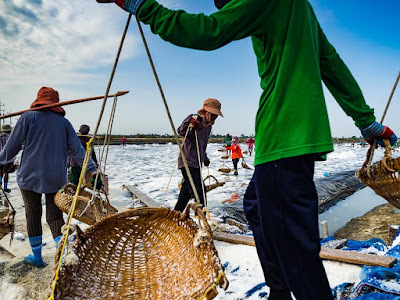 The baskets of salt workers carry out of the fields weigh between 60 and 100 pounds each and workers carry two of them suspended from bamboo yokes. 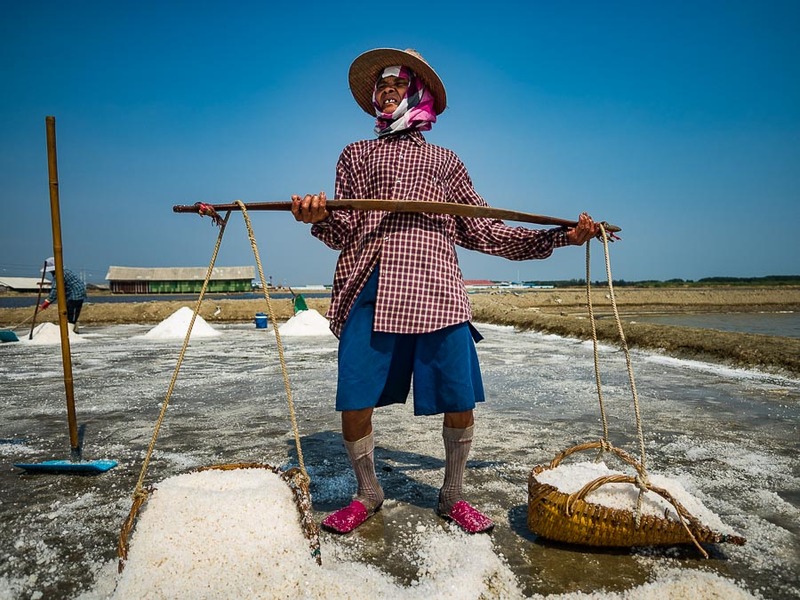 A worker rakes salt into piles that another worker will eventually put into a basket and carry to a warehouse on the edge of the salt field. Gathering salt is a seasonal activity. It starts after the rainy season and continues through the dry season until rains make it impossible for water to evaporate off the fields. The last few years were marked by excellent harvests because the drought in Thailand meant the salt gatherers had an extra month to work. This had the unfortunate but predictable effect of depressing prices (more salt at the same demand means lower prices) and stressing storage because some salt farms had to store their crops from one year to the next. This year's harvest started a little late because unseasonable rains in south central and southern Thailand flooded the fields with fresh water but weather forecasters are predicting a long dry season (and the possibility of another drought) so salt gatherers are confident of a good crop this year. A worker rinses out his salt baskets with water from an irrigation canal that serves fruit farms in the area. There are more photos of this year's salt harvest in my archive.